We utilize Dynamic Digital Maps (DDMs) in our undergraduate petrology courses to bring in accessible and exciting volcanic field areas to the students in the class room and to engage the students in research experiences. 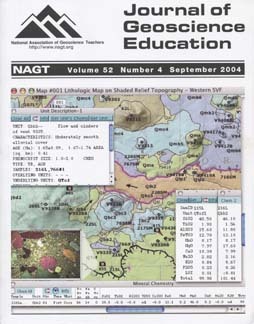 A DDM is a stand-alone computer program that presents interactive geologic maps, digital images, movies, animations, text and data (http://ddm.geo.umass.edu). We have developed exercises that use two different DDMs to provide field-based context for undergraduate research projects in petrology. The projects include a group research project on the evolution of the Tatara-San Pedro volcanic complex (Central Chilean Andes) and a laboratory exercise that studies magma evolution of the Springville Volcanic field (Arizona, USA). To assess the impact on student learning we administered a student assessment before and after the Tatara-San Pedro research project. We found significant gains in both students' confidence in ability to do research and to under stand petrology. The DDM template is presently being converted to a cross-platform open-source format that will enable others to make their own DDMs for any field of interest. DDMs are versatile and can potentially be adapted effectively from 100-level introductory geology labs to research-oriented graduate level courses and in a variety of geologic sub-disciplines. A teaching experiment, setting extremely high goals, was conducted in two courses enrolling only high school graduates in the summer before they entered college. One was a six-week Introduc tion to Geology in the field (Indiana University Judson Mead Field Station, Montana) and the other was a three-week seminar on Life in Mars in a computer cluster on campus. Students in the field course had averaged above 1350 in SAT (1991-1996), worked some 14 hours everyday, and mapped (a) an S-fold with an unconformity as its bone, and (b) an overturned anticline with splaying thrusts on its normal limb. Although no student intended to major in geology, several did, went through graduate school and have be come successful faculty and practicing geologists. Students in the Mars course had averaged 1100 in SAT (2000), worked some 8-10 hours per day, and combined their term papers into a single class-manuscript for JGE, which received mixed reviews. These tangible outcomes are commensurate with very high student satisfaction. The experiments showed that getting students engaged in physical sciences is possible but at a high cost. The environment is a system of coupled physical, chemical and biological processes that yield either a change in the state of the system or a dynamic steady-state. The conservation of mass equation is used to quantify such dynamic systems and is presented here with the acronym 'IPOLA'. The time scale for a change in state of a system can be understood with the concept of residence time. We describe a simple salt flushing laboratory activity that allows detailed investigation of rates, processes and principles of dynamic systems for both the algebra-skilled student and the minimal-calculus prepared (high school and university) student. The activity focuses on the calculation and use of the residence time as a fundamental principle defining rates-of-change in systems ("How long will it take to...?"). The 'rules-of-thumb' (time to change by 50%, time to change by 95%) and simple estimates that can be made from real data (concentration vs. time) generated by this activity provide a useful starting point for the evaluation of the environment as a dynamic process with inherent timescales for change. Students are also introduced to conversion factors, instrument correction factors, analysis of real data and a problem solving approach based on 'IPOLA'. Environmental analysis requires an understanding of processes that contribute to a system and the concept of dynamic balances. The Conservation of Mass (Heat) equation for a system determines whether (e.g.) concentration (heat) in the system will increase, decrease or remain constant. The rate at which change occurs in a system and the magnitude of that change are functions of the dynamic balance and the rate constants (residence times-1) for individual processes. We express this mass (heat) balance concept as a simplified algebraic expression ("IPOLA") and use it to evaluate the dynamics of systems. We present a classroom activity that can be accomplished in a short time with minimal cost to demonstrate these principles. Our experience suggests that this activity and the "IPOLA" equation build knowledge by developing a conceptual understanding of systems and their component processes. The Earth and Space sciences provide opportunities for content learning in inquiry-based classrooms, emphasizing ways in which science is relevant to the lives of both students and teachers. We are successfully using an Earth Systems approach to prepare preservice elementary school teachers in understanding science content and pedagogy with emphases in technology and mathematics. Using Lake Pontchartrain as the unifying theme across four courses, students learn not only science content, but also scientific process. Students perform research projects on Lake Pontchartrain and the Mississippi River, and develop models of changes in water quality that are directly comparable to longitudinal data being collected by research laboratories, Our approach fosters students': a) understanding of science and the scientific process, b) self-confidence in teaching science, c) knowledge of state science-education standards, d) ability to accurately research and prepare lessons on science topics, and e) positive attitudes towards scientific fields of study. Accomplishing these goals required on-going collaboration between the Colleges of Sciences and Education. Surveying and field-testing results suggest that the pre-service teachers in our classes are likely to apply the approach used in our courses to science teaching in their own classrooms. Electronic student response technologies (SRT) are capable of assessing teaching and learning methods in real time, and they offer an exceptional means of introducing active learning protocols in classes with large enrollments. These wireless systems allow students to key in responses with remote control units to questions posed by an instructor in the classroom. Student responses then are displayed in real time, allowing both students and instructors to gauge student comprehension instantaneously. From Spring 2002 to Spring 2003, we utilized SRT in 4 sections of a high-enrollment introductory Earth Science course (Geosc 020: Planet Earth) at Penn State University. We conducted a multi-faceted assessment of the use of SRT in our course that included quantitative and qualitative perception data from students enrolled in the course and faculty/administrator visitors to our classroom. Our preliminary assessment of the pedagogical merits of SRT in our course suggests that this technology is an effective tool for introductory geoscience education. Magnetism, the Earth as a Magnet, and Seafloor Banding - How Much Magnetism is Enough? Although seafloor banding patterns are widely taught as a key piece of evidence for plate tectonics, little research has been conducted on student understanding of magnetism in a geological context. This study was conducted in two introductory geology courses to identify the effect of students' understanding of basic magnetism on their ability to build a simple conceptual model of seafloor banding consistent with the scientifically accepted model. Students were asked open-ended questions to elicit their reasoning about magnetism, Earth magnetism, and seafloor banding. Results suggest that many students in the study had weak or alternate models of basic magnetism. These models led students to reason incorrectly about magnetic interactions of the Earth's magnetic field and Earth materials during rock formation. Even students with robust magnetic models had difficulty applying them correctly to account for the origin of seafloor banding. The viscosities of maple syrup, 0.32 ± 0.03 Pa s, molasses, 0.87 ± 0.09Pa s, ketchup, 9.8 ± 1.0 Pa s, and smooth peanut butter, 1.2 ± 0.9 x10-5 Pa s, were measured at 25 °C and 1 bar pressure for comparison withthe viscosities of natural silicate melts to aid in teaching theimportance of viscosity in igneous processes to students. Viscositymeasurements were made at a single stress state for each of thesematerials, which are probably all thixotropic, and measurement accuracyis only to within a factor of 3, nevertheless these values are adequateand useful for teaching purposes. The viscosities of most commonnatural silicate melts are bracketed by the measured viscosity ofpeanut butter, which is near the viscosity of a rhyolitic or graniticmelt + 1.8 wt% H2O at 800 °C, and of ketchup, which is near theviscosity of an anhydrous, molten tholeiitic basalt at 1200 °C. Theeffectiveness of using food to teach melt viscosities was evaluated bya survey of two student groups, a test group who had been taughtsilicate melt viscosities using food examples in two courses and acontrol group who had been taught silicate melt viscosities in theirfirst course without the use of food examples and in their secondcourse with the use of food. The results of this survey indicate thatthe test group retains their knowledge of silicate melt viscositiesbetter than the control group and demonstrate that food viscosities area useful teaching tool. A Guided Inquiry Approach to Learning the Geology of the U.S.
A guided inquiry exercise has been developed to help teach the geology of the U.S. This exercise is intended for use early in the school term when undergraduate students have little background knowledge of geology. Before beginning, students should be introduced to rock types and have a basic understanding of geologic time. This exercise uses three maps: the U.S. Geological Survey's "A Tapestry of Time and Terrain" and "Landforms of the Conterminous United States" maps, and a geologic map of the United States. Using these maps, groups of 3 to 5 students are asked to identify between 8 and 12 geologic provinces based on topography, the age of rocks, and rock types. Each student is given a blank outline map of the contiguous U.S. and each group is given a set of the three maps and colored pencils; as a group, students work to define regions in the U.S. with similar geology. A goal of 8 to 12 geologic provinces is given to help establish the level of detail being asked of students. One member of each group is asked to present their group's findings to the class, describing their geologic provinces and the reasoning behind their choices. The National Association of State Boards of Geology (ASBOG) hasadministered approximately fifty-one hundred examinations for thelicensing of geologists since the initial examination offering in 1992.The examination consists of a fundamentals portion and a practiceportion. Each portion is 4 hours in length. The average passing rateacross all administrations of the fundamentals examination is 58% andis 68% for the practice examination. For each examination, the subject matter tested is dividedinto nine areas or subject area domains based upon the results of thetask analysis (survey of the practicing profession) that guides theexamination blueprint. For the fundamentals examination, thedistribution of questions among domains is: field methods and remotesensing (28% of 110 examination questions), mineralogy, petrology,petrography, and geochemistry (14%), sedimentology, stratigraphy, andpaleontology (10%), geomorphology (6%), structural geology andtectonics (9%), geophysics and seismology (4%), hydrogeology (25%),engineering geology (3%), and mineral, petroleum, and energy resources(1%). The candidate success in each domain on the fundamentalsexaminations was determined for the last five administrations of theexaminations during the period 2002-2003. The average percentage ofquestions answered correctly in each domain was: field methods andremote sensing (67% of questions answered correctly), mineralogy,petrology, petrography, and geochemistry (58%), sedimentology,stratigraphy, and paleontology (56%), geomorphology (63%), structuralgeology and tectonics (64%), geophysics and seismology (60%),hydrogeology (67%), engineering geology in combination with mineral,petroleum, and energy resources (67%). Candidates are doing poorer in those subject areastraditionally believed to be the fundamental subject areas of anundergraduate geology education (mineralogy, petrology, sedimentology,etc). In the fall of 2002 the University of Maine's Department of EarthSciences piloted an innovative course for secondary science teachers.The course integrated instruction in curriculum design, pedagogy,assessment, and educational research, and earth systems science (ESS)content. The course met once each week for three hours during the fallsemester. The first hour each week was used for the review and contentenrichment of an ESS topic. During the second hour, the ESS topicprovided the context for knowledge and skill development associatedwith one of the targeted instructional practices. The third hour eachweek continued to use the ESS topic for context and was used to creatematerials or practice skills associated with instructing or assessingthe ESS topic in secondary classrooms. Data concerning student knowledge, attitudes, andinstructional practices were collected using assessments createdspecifically for the course. Analyses of both quantitative andqualitative data indicate that the course strengthened participantunderstanding of the targeted scientific concepts and that theparticipants understood and could apply and implement the instructionalconcepts. The course was valuable to the participants and instructorsand is a model that may be transferable to other disciplines. Ongoing integration of technology with geology requires today'sgeoscience students to develop solid geotechnical skills. Recentadvances in analog-to-digital technology enable easy and inexpensiveconstruction of a multi-channel seismic data collection system that canbe used to teach students the fundamentals of seismology. Here Idemonstrate how to construct and use a simple multi-channel seismicdevice for class experiments. The experiments act as a solid foundationfor anyone hoping to develop active-source classroom seismologylaboratories. In particular, the experiments give students hands-onexperience with designing seismic surveys, data collection, and dataprocessing and should compliment any introductory seismology orgeophysics course. The process of spreading at a divergent boundary, the formation of sea-floor magnetic patterns, and the mechanism of transform faulting can be demonstrated using a very simple paper model. The use of this model in an introductory geology course allows for active and experiential learning of concepts that can be difficult to understand through passive learning techniques.